This is a written report for the Painted Brain. So far today was great fun, a fascinating and interesting day. I awoke at a certain time, I left home at twelve-thirty pm because I was going to meet some people between one and two pm at the Los Angeles County Museum of Art. Today was a clear pretty Friday afternoon not very hot nor very cold beautiful blue sky with a few clouds. The day before I thought it was going to be cold windy and rainy like it was last Friday but it does not hurt being wrong sometimes. I waited and got on the bus it takes only one bus ride to get to LACMA and when I got there I searched for someone that I know, hoping that I would find familiar faces. I looked around for a few minutes until Sergio and I found each other then we went to sit down on the bench, and I began to wonder about all the flashbacks that came back to me at once. I have history at the museum. I have been visiting LACMA since childhood, and I am reporting and documenting my experience, about what I’ve learned today on my latest visit to LACMA. My earliest visit to the art museum was as a boy, still in elementary school (which was not very long ago at all) but back then I did not go by choice, and by that I mean of my own free will. Back then, I thought that art museums were dull odd weird and boring as hell. I had no interest in it at that time. I did not appreciate art as a kid unless it was something I did myself but I will never forget my early introduction to the world of art. I had to go on school field trips in those days, I felt forced and obligated to go, but now I feel and see that I was fortunate, that I had a teacher who planted the seeds in me, of the love of art. I will also remember how the love of art was born in me and how it developed and grew as time went on and I got older. It wasn’t until I became a teenager that I started being seriously into art I started visiting art museums because art was no longer boring and bogus to me anymore. Every time I visit a museum, I try to remember the times I visited before and what art collection I went to see. LACMA was the first art museum I ever visited, it was my first introduction to all kinds of art. I have seen so many exhibits that I can’t even remember all of them, but I can remember a few, like the King Tut exhibit. However, the museum complex has changed beyond recognition in the last thirteen years. The spot where I was sitting with Sergio waiting for the others to show up did not even exist back then. The Levitt Pavilion is new and so is the court yard (and the light poles, too). I remember when all of this was being constructed between the older LACMA buildings and the old May Company building. 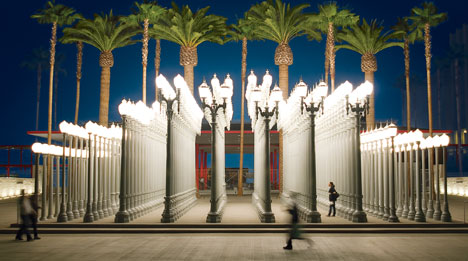 I’ve learned that LACMA was established and opened to the public in the spring of 1965. The Japanese Pavilion was built and first opened to the public in the fall of 1988 .Sergio and I waited for almost an hour for the other people we know to show up. In the process, I got bored so I took my camera, a digital Canon, and went to take pictures of the statues and the garden. The statues were made by a French man named Auguste Rodin. He was born in the second quarter of the nineteenth century and he died in the early twentieth century. He was a Victorian era artist. When I finished taking pictures of his work and of the garden, I checked to see what time it was. I had lost track of time. I went back to where I’d been sitting and waiting and to my surprised everyone Sergio and I had been waiting for where already there I was so glad that I found them just in time, and I thanked them for waiting for me. We all got in line for tickets and when my turn came Dave paid for my ticket. I thanked him and told him that I will always remember his generosity. I guess it was my lucky day, too short to enjoy the entire museum but I enjoyed those two short hours. I took pictures of some art pieces and learned as much as could about them. I studied Pacific Oceanic art some ceramics from Papua New Guinea made mostly of wood back in the nineteenth century. Next I went to the Japanese Pavilion. Inside they have wood block prints and water color paintings that are very beautiful to look at. There are feudal lords and ladies ,Zen Buddhist priests, shoguns, the Emperor, also samurai warriors. Other pictures are done on paper made from bamboo. All of these prints date from the sixteenth or seventeenth century to the third quarter of the nineteenth century. The reason I did not take more pictures with my camera was because it needed time to recharge. Time flew by really fast, damn, I couldn’t really believe it was five pm, I checked the time in my cell phone just in time. Then I had to go back and reunite with my friends so I went back to where we were sitting to say good bye and go home. We said our good byes to each other and everyone went their separate ways. I stayed at LACMA for at least two more hours. I checked out the gift shop and while I was there I read a few books and checked out some postcards. I took a long look at what they sell there until I came across a journal called Museum Guided Art Journal. I checked the price and I bought it. Once I was out of the store I looked at the time and damn, it was ten minutes past seven pm, almost seven-fifteen, so I left for the bus stop, waited for the bus, ready to go home. Raffi Rivetes has been a member of Painted Brain for many years, and many of his photographs appear here in Painted Brain News.